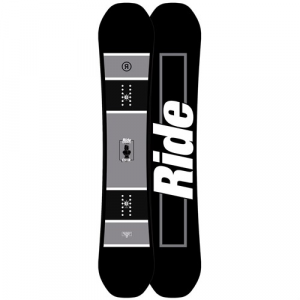 Ride Crook Snowboard Only $258! November 24, 2016 – The Ride Crook was one of those park boards that kinda got overlooked when it came out. At over $400 it was hard to stand out of the pack. At under $260 it’s a no brainer. It’s built for all around park, so basically jumps and jibs. If that’s what you’re looking to do on a budget, check out the Ride Crook snowboard. It must be a park day if you’re riding the jib-worthy Ride Crook Snowboard. Sure the Crook won’t necessarily send you to prison, but since it’s street-friendly you will be tempted to go hit that handrail at the high school during a snowstorm. The Crook is buttery and forgiving due to the LowRize™ Rocker profile which utilizes mellow rocker at the nose and tail and applies a flat and stable area underfoot for mega-press-ability completed with a soft flex. The Ride Crook Snowboard is a Ride team favorite and can be yours too – just stay out of trouble. LowRize™ Rocker – A twin rockered shape that gently lifts the contact points out of the snow to avoid catching an edge and has a nearly flat zone under foot. Flex Rating: 3 (1 Soft – Stiff) – A softer flex is forgiving, playful and ideal for jibs or progression. Twin – Twin snowboards are playful and perfect for riding switch. Foundation™ Core – Aspen wood from tip-to-tail for durability, pop, and flex. Biaxial Glass – 90° and 0° angles are fun and forgiving. Ride’s unique glass designs are flatter and more consistent; therefore they are stronger with no gaps or stretching as can be found in woven glass. Slimewalls® – Ride’s exclusive Slimewalls® are forgiving and ductile, absorbing impacts rather than defending against them. Just like your skate wheels, the urethane in Slimewalls® smooths the interaction with the snow, wood or metal surfaces you ride on. Fusion 1500™ Base – Highly wax absorbent and easy to repair.